mostly crafty. mostly. : thrift scores! I went to four Goodwills on Saturday for their 50% off sales, and I scored some major loot. Brand new Halloween decorations- from Target's 06 seasonal collection. 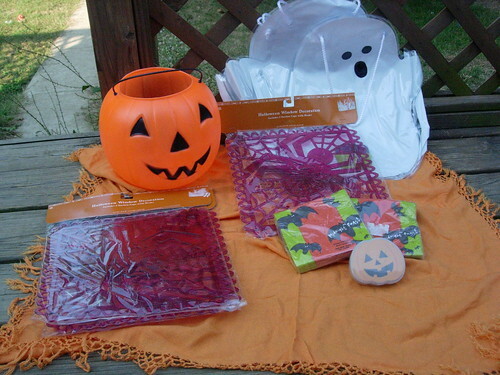 Two of the ghost bags are for my neighbor kids, the napkins and a ghost bag are for my Witches Caldron swapee. Not sure what I'm going to do with the purple spideys yet...maybe swap them? And as for the pumpkin, well, you can never have too many! Sparkly silver purse for my sister, who lost her silver wristlet. Then found it again right after I gave this to her. 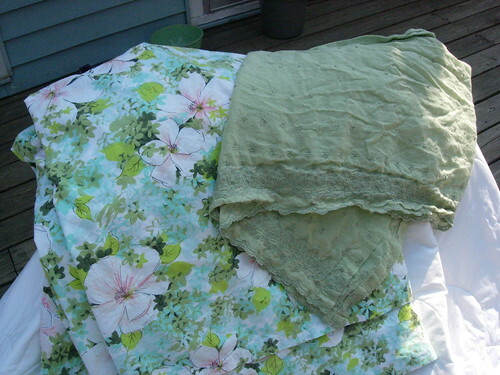 Almost-queen sized thrifted Springmaid flat sheet. It's quite a bit longer than a queen bed, and almost as wide. It's super soft, but still kind of smells like perfume even after washing. The curtain is a Shabby Chic Target curtain, and I didn't realize it was a curtain and not a table runner until later. But it perfectly matches my freshly painted bathroom!